She’s getting the sister wrap to MY. 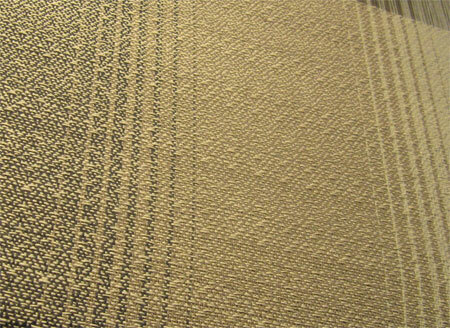 JM chose a natural weft in a weave pattern I haven’t used before. That’s always enjoyable to me, to get to treadle something different, to watch the pattern emerge as I throw the shuttle and beat the weft in place. I knew that the pattern wouldn’t be as distinct as the hearts, it would let the colors be the stars of the show. What I didn’t know was how much texture this pattern would provide. I really like that! I can’t wait to see if this changes after wet finishing and pressing. Anyway, I’m happily weaving along on this wrap, I get to about the half way point, and UH-OH! I can see the end of my warp! That’s MOST DEFINITELY NOT GOOD! I take measurements, I go back to my original worksheet for warp measurements, I fret, I fuss, I email JM to give her the bad news. I tell her I can sell her a shorter piece for a ring sling or I can re-weave. I’m really crazy mad, ‘cuz I can’t figure out how this happened! And I’m tired of having to re-weave because of some stupid mistake I made! JM replies quickly and tells me it’ll likely be okay. Whew! She’s been on my list for her own custom, and although that’s some months away, she can most likely deal with a substantially-shorter-than-ordered wrap. 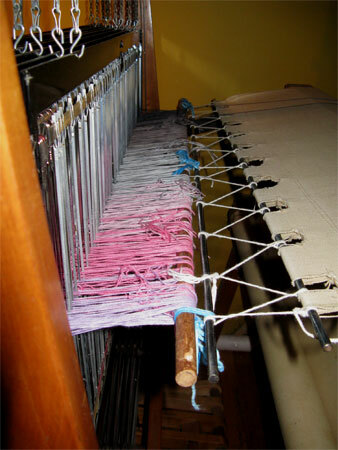 So I weave every single inch that I can on this warp. 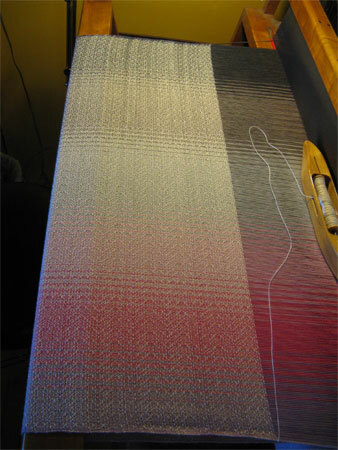 I hate weaving this close to the end of a warp…the shed is small, threads stick, it’s hard. So I usually make sure I have plenty of extra warp length. How DID this happen? If I can’t figure that out I can’t avoid repeating this awful mistake. I cut the wraps off the loom and hem them immediately. Then I take some measurements. Although I doubted it, I was sort of hoping that I’m made measurement errors in the first wrap (MY’s), weaving much more length than I was supposed to. Nope, it was just what it should have been. I measure the second wrap (JM’s) – I’m about 45″ short! Then I go to the loom and estimate how much extra length I usually have for my baby wraps. It’s about another 45″. Ohhhhh…the light bulb goes off. Clearly I made one less turn around my warping mill than I should have. That’d give me 96″ less than I should have. I’ve never done THAT before; aren’t I great at making new mistakes all the time?! While I hate that I made that huge error, I’m glad it’s clear what I did. I know myself well enough to know that when I make a big mistake, it’s quite UNlikely I’ll make it again. I will pay plenty of attention to avoid it. At least for a few years. The wraps have now been through the washer and are in the dryer. I’ll measure them when they come out and let JM know the length. I hope it’s not too short for her. Knowing where the mistake was made is three quarters of the way to solving it. Crossing my fingers for the length and hoping it will be long enough for her and the wee one. The pattern is quite different and I like it too. Have a great holiday weekend. I couldn’t agree more with your assessment, Lynda. Although I wasn’t happy I made the mistake, I was distraught before I figured out what I did wrong. Now that I know, I can pay more attention with my measuring string.